If you and your partner work full time, you likely need an extra pair of hands at home. Extra help can be costly, but if you’re away from your family, your best option will likely be to have a nanny or a maid. You want to have someone who can look after your kids and help run your house while you build a new life and progress your career in Dubai. When you have a maid, their visa will have to be renewed every year. As the sponsor, it will be up to you to ensure your maid’s visa remains current and doesn’t expire. You’ll need to go through the renewal process, and this can be incredibly time-consuming. In Dubai, maids can only be hired by sponsors who have an income of at least AED 5,000 per month, a residency contract, and facilities to accommodate the maid. As a sponsor, visa renewal is your responsibility. As an expatriate, the entire renewal process can be daunting. While there is a grace period, your maid’s visa must be renewed within 30 days of the grace period after its expiry. If renewal exceeds the grace period, you risk being fined. What Documents Are Required to Renew a Maid’s Visa In Dubai? Not only can the entire renewal process get expensive, it can also be time-consuming in terms of gathering paperwork. What Is the Procedure for Renewing Your Maid’s Residency? The procedure for renewing your maid’s visa can be a lengthy one with at least 6 steps. It starts off with typing out the medical and Emirates ID applications. You will then have to take your helper for her medical exam which will take a few hours to complete. After the results are issued, you will need to visit a typing center and submit the necessary paperwork. Your maid’s labor contract must also be updated and signed by both you and your maid, after which you’ll receive three copies of the contract and a visa form. Once you submit the additional necessary documents, you will have to wait for feedback in case there is any issue with the documents or their approval. If you do get an approval, the passport will still need to be processed by immigration staff for renewing the residency. The Emirates ID will then be sent by post which will need to be picked up. Take note that there can be unexpected changes in document requirements, fees, and processes involved. It can be a daunting prospect to try to keep up and stay updated. Fortunately, there’s a solution that can let you avoid these hassles of visa renewal processing, so that you can spend more quality time with your family instead. You can actually delegate the work of liaising with the government for your maid’s visa renewal. At Assist AE, we understand the importance of family time and how scarce it can be. Rather than going through the hassle of renewing your maid’s visa yourself, you can leave the entire process to us with peace of mind. You’ll be free to spend more time with your loved ones as well as have more time for the other things that you enjoy doing. By outsourcing the renewal process to us, you can let us take care of any red tape, document processing, and document pick-ups. We’ll provide you with progress updates so you’ll know how things are going. 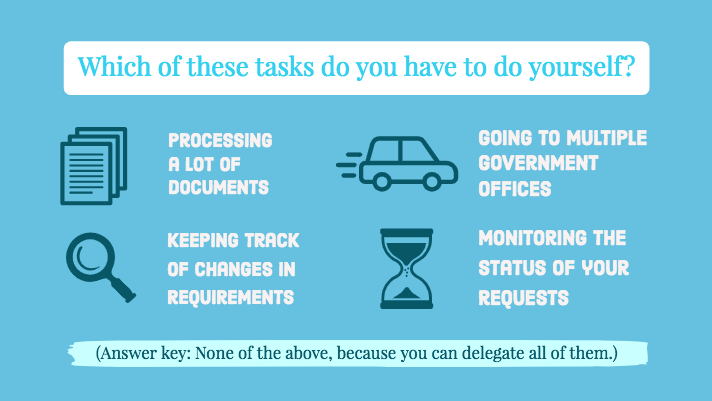 We can handle all the steps you’d like to delegate. For example, we can gather all the necessary documents for you, get them typed up (and get them translated if needed), and even take your maid for their medical test. We will dedicate a team member who will go to all the relevant government offices for you. Once the process is done, we can deliver the documents to you for your convenience. We can also handle all future renewals, so you can carry on with your busy life in Dubai without having to repeatedly take time away from work to deal with government officials. While renewing your maid’s visa is an important task, you simply don’t have to deal with it yourself. You can hand it over to us for a nominal fee. Our team is highly experienced when it comes to dealing with the government here in Dubai, and we keep abreast of all their requirements as well as their changes. That means you won’t have to miss out on work or family time just to spend a lot of time in government offices, let alone in queues. Leave the heavy lifting to us while your family enjoys working and living in Dubai. Learn more about how Assist AE can help you with your maid’s visa renewal today.